Nanotechnology is creating new opportunities for fighting disease – from delivering drugs in smart packaging to nanobots powered by the world’s tiniest engines. Chemotherapy benefits a great many patients but the side effects can be brutal. When a patient is injected with an anti-cancer drug, the idea is that the molecules will seek out and destroy rogue tumour cells. However, relatively large amounts need to be administered to reach the target in high enough concentrations to be effective. As a result of this high drug concentration, healthy cells may be killed as well as cancer cells, leaving many patients weak, nauseated and vulnerable to infection. One way that researchers are attempting to improve the safety and efficacy of drugs is to use a relatively new area of research known as nanothrapeutics to target drug delivery just to the cells that need it. Professor Sir Mark Welland is Head of the Electrical Engineering Division at Cambridge. In recent years, his research has focused on nanotherapeutics, working in collaboration with clinicians and industry to develop better, safer drugs. He and his colleagues don’t design new drugs; instead, they design and build smart packaging for existing drugs. Nanotherapeutics come in many different configurations, but the easiest way to think about them is as small, benign particles filled with a drug. They can be injected in the same way as a normal drug, and are carried through the bloodstream to the target organ, tissue or cell. At this point, a change in the local environment, such as pH, or the use of light or ultrasound, causes the nanoparticles to release their cargo. Nano-sized tools are increasingly being looked at for diagnosis, drug delivery and therapy. “There are a huge number of possibilities right now, and probably more to come, which is why there’s been so much interest,” says Welland. Using clever chemistry and engineering at the nanoscale, drugs can be ‘taught’ to behave like a Trojan horse, or to hold their fire until just the right moment, or to recognise the target they’re looking for. In 2014, he and collaborators demonstrated that gold nanoparticles could be used to ‘smuggle’ chemotherapy drugs into cancer cells in glioblastoma multiforme, the most common and aggressive type of brain cancer in adults, which is notoriously difficult to treat. The team engineered nanostructures containing gold and cisplatin, a conventional chemotherapy drug. A coating on the particles made them attracted to tumour cells from glioblastoma patients, so that the nanostructures bound and were absorbed into the cancer cells. Once inside, these nanostructures were exposed to radiotherapy. This caused the gold to release electrons that damaged the cancer cell’s DNA and its overall structure, enhancing the impact of the chemotherapy drug. The process was so effective that 20 days later, the cell culture showed no evidence of any revival, suggesting that the tumour cells had been destroyed. While the technique is still several years away from use in humans, tests have begun in mice. Welland’s group is working with MedImmune, the biologics R&D arm of pharmaceutical company AstraZeneca, to study the stability of drugs and to design ways to deliver them more effectively using nanotechnology. The researchers are also targeting diseases like tuberculosis (TB). With funding from the Rosetrees Trust, Welland and postdoctoral researcher Dr Íris da luz Batalha are working with Professor Andres Floto in the Department of Medicine to improve the efficacy of TB drugs. Their solution has been to design and develop nontoxic, biodegradable polymers that can be ‘fused’ with TB drug molecules. As polymer molecules have a long, chain-like shape, drugs can be attached along the length of the polymer backbone, meaning that very large amounts of the drug can be loaded onto each polymer molecule. The polymers are stable in the bloodstream and release the drugs they carry when they reach the target cell. Inside the cell, the pH drops, which causes the polymer to release the drug. In fact, the polymers worked so well for TB drugs that another of Welland’s postdoctoral researchers, Dr Myriam Ouberaï, has formed a start-up company, Spirea, which is raising funding to develop the polymers for use with oncology drugs. Ouberaï is hoping to establish a collaboration with a pharma company in the next two years. Could nanotechnology move beyond therapeutics to a time when nanomachines keep us healthy by patrolling, monitoring and repairing the body? Nanomachines have long been a dream of scientists and public alike. But working out how to make them move has meant they’ve remained in the realm of science fiction. But last year, Professor Jeremy Baumberg and colleagues in Cambridge and the University of Bath developed the world’s tiniest engine – just a few billionths of a metre [nanometre] in size. It’s biocompatible, cost-effective to manufacture, fast to respond and energy efficient. The forces exerted by these ‘ANTs’ (for ‘actuating nano-transducers’) are nearly a hundred times larger than those for any known device, motor or muscle. To make them, tiny charged particles of gold, bound together with a temperature-responsive polymer gel, are heated with a laser. As the polymer coatings expel water from the gel and collapse, a large amount of elastic energy is stored in a fraction of a second. On cooling, the particles spring apart and release energy. The researchers hope to use this ability of ANTs to produce very large forces relative to their weight to develop three-dimensional machines that swim, have pumps that take on fluid to sense the environment and are small enough to move around our bloodstream. Working with Cambridge Enterprise, the University’s commercialisation arm, the team in Cambridge’s Nanophotonics Centre hopes to commercialise the technology for microfluidics bio-applications. The work is funded by the Engineering and Physical Sciences Research Council and the European Research Council. “There’s a revolution happening in personalised healthcare, and for that we need sensors not just on the outside but on the inside,” explains Baumberg, who leads an interdisciplinary Strategic Research Network and Doctoral Training Centre focused on nanoscience and nanotechnology. I’m not sure what could have occasioned this latest press release and related video featuring Welland and nanotherapeutics other than guessing that it was a slow news period. This entry was posted in electronics, medicine, nanotechnology and tagged actuating nano-transducers (ANTS), Andres Floto, AstraZeneca, Cambridge University, cancer, Dexter Johnson, drug delivery, Engineering and Physical Sciences Research Council (EPSRC), EPSRC, European Research Council, gold nanoparticles, Íris da luz Batalha, Jeremy Baumberg, Mark Welland, MedImmune, Myriam Ouberaï, Nanomachines, nanothrapeutics, Nokia morph, personalised healthcare, Rosetrees Trust, Spirea, tuberculosis (TB), UK, University of Bath, University of Cambridge on August 9, 2017 by Maryse de la Giroday. Are there any leaders in the ‘graphene race’? Fullerex is a leading independent broker of nanomaterials and nano-intermediates. Our mission is to support the advancement of nanotechnology in creating radical, transformative and sustainable improvement to society. We are dedicated to achieving these aims by accelerating the commercialisation and usage of nanomaterials across industry and beyond. Fullerex is active in market development and physical trading of advanced materials. We generate demand for nanomaterials across synergistic markets by stimulating innovation with end-users and ensuring robust supply chains are in place to address the growing commercial trade interest. Our end-user markets include Polymers and Polymer Composites, Coatings, Tyre and Rubber, Cementitious Composites, 3D Printing and Printed Electronics, the Energy sector, Lubricating Oils and Functional Fluids. The materials we cover: Nanomaterials: Includes fullerenes, carbon nanotubes and graphene, metal and metal oxide nanoparticles, and organic-inorganic hybrids. Supplied as raw nanopowders or ready-to-use dispersions and concentrates. Nano-intermediates: Producer goods and semi-finished products such as nano-enabled coatings, polymer masterbatches, conductive inks, thermal interface materials and catalysts. Fullerex was founded by Joe and Tom Eldridge, brothers with a keen interest in nanotechnology and the associated emerging market for nanomaterials. Joe has a strong background in trading with nearly 10 years’ experience as a stockbroker, managing client accounts for European Equities and FX. At University he read Mathematics at Imperial College London gaining a BSc degree and has closely followed the markets for disruptive technologies and advanced materials for a number of years. Tom worked in the City of London for 7 years in commercial roles throughout his professional career, with an expertise in market data, financial and regulatory news. In his academic background, he earned a BSc degree in Physics and Philosophy at Kings College London and is a member of the Institute of Physics. As a result, Fullerex has the strong management composition that allows the company to support the growth of the nascent and highly promising nanomaterials industry. Fullerex is a flexible company with drive, enthusiasm and experience, committed to aiding the development of this market. – 98% of the Chinese patent applications only cover China, so therefore have no worldwide monopoly. – A large number of the Chinese patents are filed in December, possibly due to demand to meet patent quotas. The implication being that the patent filings follow a politically driven agenda, rather than a purely innovation or commercially driven agenda. – In general, inventors could be more likely to file for patent protection in some countries rather than others e.g. for tax purposes. Which therefore does not give a truly accurate picture of where all the actual research activity is based. – Measuring the proportion of graphene related patents to overall patents is more indicative of graphene specialisation, which shows that Singapore has the largest proportion of graphene patents, followed by China, then South Korea. Following the recent launch of the latest edition of the Bulk Graphene Pricing Report, which is available exclusively through The Graphene Council, Fullerex has updated its comprehensive list of graphene producers worldwide, and below is a summary of the number of graphene producers by country in 2017. The total number of graphene producers identified is 142, across 27 countries. This research expands upon previous surveys of the graphene industry, such as the big data analysis performed by Nesta in 2015 (Shapira, 2015). The study by Nesta [formerly NESTA, National Endowment for Science, Technology and the Arts) is an independent charity that works to increase the innovation capacity of the UK; see Wikipedia here for more about NESTA] revealed 65 producers throughout 16 countries but was unable to glean accurate data on producers in Asia, particularly China. As we can now see however from the data collected by Fullerex, China has the largest number of graphene producers, followed by the USA, and then the UK. In addition to having more companies active in the production and sale of graphene than any other country, China also holds about 2/3rds of the global production capacity, according to Fullerex. As with the patent landscape, rather than looking at the absolute figures, we can review the numbers in relative terms. For instance, if we normalise to account for the differences in the size of each country, by looking at the number of producers as a proportion of GDP, we see the following: Spain (7.18), UK (4.48), India (3.73), China (3.57), Canada (3.28) [emphasis mine], USA (1.79) (United Nations, 2013). Unsurprisingly, each leading country has a national strategy for economic development which involves graphene prominently. For instance, The Spanish Council for Scientific Research has lent 9 of its institutes along with 10 universities and other public R&D labs involved in coordinating graphene projects with industry. The Natural Sciences and Engineering Research Council of Canada [NSERC] has placed graphene as one of five research topics in its target area of “Advanced Manufacturing” for Strategic Partnership Grants. The UK government highlights advanced materials as one of its Eight Great Technologies, within which graphene is a major part of, having received investment for the NGI and GEIC buildings, along with EPSRC and Innovate UK projects. I wrote previously about the UK punching above its weight in terms of research, ( http://fullerex.com/index.php/articles/130-the-uk-needs-an-industrial-revolution-can-graphene-deliver/ ) but that R&D spending relative to GDP was too low compared to other developed nations. It is good to see that investment into graphene production in the UK is bucking that trend, and we should anticipate this will provide a positive economic outcome. Yes, I’m particularly interested in the fact Canada becomes more important as a producer when the numbers are relative but it is interesting to compare the chart with Eldridge’s text and to note how importance shifts depending on what numbers are being considered. I recommend reading Eldridge’s piece in its entirety. On December 13, 2016 we were excited to announce the completion of our drill program at the La Loutre flake graphite property. We received very positive results from our 1550 meter drilling program in 2015 in the area we are drilling now. In that release I stated, ”The intercepts of multiple zones of mineralization in the Refractory Zone where we have reported high grade intercepts previously is a very promising sign. The samples have been rushed to the ALS Laboratory for full assay testing,” We hope to have the results of those assays shortly. December 16, 2016 Lomiko announced a 10:1 roll back of our shares. We believe that this roll back is important as we work towards securing long term equity financing for the company. Lomiko began trading on the basis of the roll back on December 19. We believe that Graphite has a bright future because of the many new products that will rely on the material. I have attached a link to a video on Lomiko, Graphite and Graphene. January 3, 2017 Lomiko announced the extension and modification of its option agreements with Canadian Strategic Metals Inc. for the La Loutre and Lac des Iles properties. The effect of this extension is to give Lomiko additional time to complete the required work under the agreements. Going forward Lomiko is in a much stronger position as the result of our share roll back. Potential equity funders who are very interested in our forthcoming assay results from La Loutre and the overall prospects of the company, have been reassured by our share consolidation. Looking forward to 2017, we anticipate the assays of the La Loutre drilling to be delivered in the next 90 days, sooner we hope. We also anticipate additional equity funding will become available for the further exploration and delineation of the La Loutre and Lac des Iles properties and deposits. More generally, we are confident that the market for large flake graphite will become firmer in 2017. Lomikos strategy of identifying near surface, ready to mine, graphite nodes puts us in the position to take advantage of improvements in the graphite price without having to commit large sums to massive mine development. As we identify and analyze the graphite nodes we are finding we increase the potential resources of the company. 2017 should see significantly improved resource estimates for Lomikos properties. As a general rule, we hate to see an announcement of a share rollback, however, there exceptions which we cover below. Investors should always be aware that if a company has, say over 150 million shares outstanding, in our opinion, it is a potential candidate for a rollback and the announcement should not come as a surprise. Weak markets, a low share price, a large number of shares outstanding, little or no cash and you have a company which is an idea candidate for a rollback. The basic concept of a rollback or consolidation in a company’s shares is rather simple. We are witnessing a few cases of rollbacks not with the purpose of raising more money but rather to facilitate the listing of the company’s shares on the NYSE [New York Stock Exchange] Amex. I have no idea what situation Lomiko finds itself in but it should be noted that graphere research has been active since 2004 when the first graphene sheets were extracted from graphite. This is a relatively new field of endeavour and Lomiko (along with other companies) is in the position of pioneering the effort here in Canada. That said, there are many competitors to graphene and major international race to commercialize nanotechnology-enabled products. Are there any leaders in the ‘graphene race? Getting back to the question in the headline, I don’t think there are any leaders at the moment. No one seems to have what they used to call “a killer app,” that one application/product that everyone wants and which drive demand for graphene. This entry was posted in business, graphene, intellectual property, nanotechnology and tagged CambridgeIP, Canada, Canadian Strategic Metals, China, Dudley Pierce Baker, EPSRC, graphene producers, graphite, India, Innovate UK, Is China still leading the graphene race?, La Loutre, La Loutre Flake Graphite Property, La Loutre flake graphite property.Lomiko Metals, Lac Des Iles, large flake graphite, nano-intermediates. Joe Eldridge, nanomaterials, Natural Sciences and Engineering Research Council of Canada, NESTA, NESTA (National Endowment for Science Technology and the Arts), NSERC, Nw York Stock Exchange Annex, patents, share rollback, Singapore, South Korea, Spain, Spanish Council for Scientific Research, Tom Eldridge Fullerex, UK, UK Engineering and Physical Sciences Research Council, UK Intellectual Property Office, US on January 12, 2017 by Maryse de la Giroday. Self-cleaning: The window is ultra-resistant to water, so rain hitting the outside forms spherical droplets that roll easily over the surface – picking up dirt, dust and other contaminants and carrying them away. This is due to the pencil-like, conical design of nanostructures engraved onto the glass, trapping air and ensuring only a tiny amount of water comes into contact with the surface. This is different from normal glass, where raindrops cling to the surface, slide down more slowly and leave marks behind. Energy-saving: The glass is coated with a very thin (5-10nm) film of vanadium dioxide which during cold periods stops thermal radiation escaping and so prevents heat loss; during hot periods it prevents infrared radiation from the sun entering the building. Vanadium dioxide is a cheap and abundant material, combining with the thinness of the coating to offer real cost and sustainability advantages over silver/gold-based and other coatings used by current energy-saving windows. Anti-glare: The design of the nanostructures also gives the windows the same anti-reflective properties found in the eyes of moths and other creatures that have evolved to hide from predators. It cuts the amount of light reflected internally in a room to less than 5 per cent – compared with the 20-30 per cent achieved by other prototype vanadium dioxide coated, energy-saving windows – with this reduction in ‘glare’ providing a big boost to occupant comfort. This is the first time that a nanostructure has been combined with a thermochromic coating. The bio-inspired nanostructure amplifies the thermochromics properties of the coating and the net result is a self-cleaning, highly performing smart window, said Dr Ioannis Papakonstantinou of UCL. The UCL team calculate that the windows could result in a reduction in heating bills of up to 40 per cent, with the precise amount in any particular case depending on the exact latitude of the building where they are incorporated. Windows made of the ground-breaking glass could be especially well-suited to use in high-rise office buildings. Dr Ioannis Papakonstantinou of UCL, project leader, explains: It’s currently estimated that, because of the obvious difficulties involved, the cost of cleaning a skyscraper’s windows in its first 5 years is the same as the original cost of installing them. Our glass could drastically cut this expenditure, quite apart from the appeal of lower energy bills and improved occupant productivity thanks to less glare. As the trend in architecture continues towards the inclusion of more glass, it’s vital that windows are as low-maintenance as possible. Discussions are now under way with UK glass manufacturers with a view to driving this new window concept towards commercialisation. The key is to develop ways of scaling up the nano-manufacturing methods that the UCL team have specially developed to produce the glass, as well as scaling up the vanadium dioxide coating process. Smart windows could begin to reach the market within around 3-5 years [emphasis mine], depending on the team’s success in securing industrial interest. Dr Papakonstantinou says: We also hope to develop a ‘smart’ film that incorporates our nanostructures and can easily be added to conventional domestic, office, factory and other windows on a DIY [do-it-yourself] basis to deliver the triple benefit of lower energy use, less light reflection and self-cleaning, without significantly affecting aesthetics. Professor Philip Nelson, Chief Executive of EPSRC said: This project is an example of how investing in excellent research drives innovation to produce tangible benefits. In this case the new technique could deliver both energy savings and cost reductions. A 5-year European Research Council (ERC) starting grant (IntelGlazing) has been awarded to fabricate smart windows on a large scale and test them under realistic, outdoor environmental conditions. The UCL team that developed the prototype smart window includes Mr Alaric Taylor, a PhD student in Dr Papakonstantinou’s group, and Professor Ivan Parkin from UCL’s Department of Chemistry. One last note, these new windows are the outcome of a 2.5 year EPSRC funded project: Biologically Inspired Nanostructures for Smart Windows with Antireflection and Self-Cleaning Properties, which ended in Sept. 2015. This entry was posted in biomimcry, business, energy, environment, manufacturing, nanotechnology and tagged ‘smart’ film, Alaric Taylor, anti-glare, bio-inspired, Biologically Inspired Nanostructures for Smart Windows with Antireflection and Self-Cleaning Properties, commercialization, energy-saving, EPSRC, European Research Council (ERC), infrared radiation, IntelGlazing, Ioannis Papakonstantinou, Ivan Parkin, Philip Nelson, self-cleaning, smart window, thermal radiation, UCL, UK Engineering and Physical Sciences Research Council, University College London, vanadium dioxide film on January 21, 2016 by Maryse de la Giroday. Sadly, I found out about the event after it took place (April 25, 2014) but I’m including it here as I think it serves a primer on putting together an imaginative art/science (art/sci) event, as well, synthetic biology is a topic I’ve covered here many times. The emerging field of synthetic biology crosses the boundary between science and design, in order to design and manufacture biologically based parts, devices and systems that do not exist in the natural world, as well as the redesign of existing, natural biological systems. This new technology has the potential to create new organisms for a variety of applications from materials to machines. What role can artists and designers play in our biological future? This Friday [April 25, 2014], the Victoria & Albert Museum’s Friday Late turns the V&A into a living laboratory, bringing science and design together for one night of events, workshops and installations. It will also feature the official launch of a new EPSRC-funded book ‘Synthetic Aesthetics: Investigating Synthetic Biology’s Designs on Nature’. The book, by Alexandra Daisy Ginsberg, Jane Calvert, Pablo Schyfter, Alistair Elfick and Drew Endy, emerged from a research project ‘Sandpit: Synthetic aesthetics: connecting synthetic biology and creative design’ which was funded by the UK’s Engineering and Physical Sciences Research Council (EPSRC) and the National Science Foundation in the US. Alexandra Daisy Ginsberg is a London-based artist, designer, and writer. Jane Calvert is a social scientist based in Science, Technology and Innovation Studies at the University of Edinburgh. Pablo Schyfter is a social scientist based in Science, Technology and Innovation Studies at the University of Edinburgh. Alistair Elfick is Codirector of the SynthSys Centre at the University of Edinburgh. Can we design life itself? The emerging field of synthetic biology crosses the boundary between science and design to manipulate the stuff of life. These new designers use life as a programmable material, creating new organisms with radical applications from materials to machines. Friday Late turns the V&A into a living laboratory, bringing science and design together for one night of events, workshops and installations, each exploring our biological future. The evening will feature the book launch of Synthetic Aesthetics: Investigating Synthetic Biology’s Designs on Nature (MIT Press). The book marks an important point in the development of the emerging discipline of synthetic biology, sitting at the intersection between design and science. The book is a result of research funded by the UK’s Engineering and Physical Sciences Research Council and the National Science Foundation in the US. All events are free and places are designated on a first come, first served basis, unless stated otherwise. Filming and photography will be taking place at this event. Please note, if the Museum reaches capacity we will allow access on a one-in-one-out basis. A functioning synthetic biology lab in the grand entrance places this experimental field front and centre within the historic home of the V&A. Conducting experiments and answering questions from visitors, the lab will be run by synthetic biologists from Imperial College London’s EPSRC National Centre for Synthetic Biology & Innovation and SynbiCITE UK Innovation and Knowledge Centre for Synthetic Biology. Young artists from the Royal College of Art’s Visual Communication course explore synthetic biology through projections on the walls of the galleries. Each one takes its inspiration from the sculptures around it in a series of site-specific installations. What would it mean for our daily lives if we could grow our objects? Xylinum Cones presents an experimental production line that uses bacteria to grow geometric forms. Meet designers Jannis Huelsen and Stefan Schwabe and learn how they are developing a renewable cellulose composite for future industrial uses. This film tells the story of how biologist Christina Agapakis and smell provocateur Sissel Tolaas produce human cheese. Using swabs from hands, feet, noses and armpits as starter cultures, they produce unique smelling fresh cheeses as unusual portraits of our biological lives. A workshop led by scientist Thomas Landrain and designer Marie-Sarah Adenis showing how to ‘grow your own ink’. Try out some of the steps, from the culturing of bacteria to the extraction and purification of biological pigments. Discover the marvellous properties of this one-of-a-kind ink. Take a trip into the Petri dish, where microchips meet microbes, cells become computers and all is not quite as it seems. Bio Computation, a short film by David Benjamin and Hy-Fi by The Living demonstrate revolutionary design using new composite building materials at the intersection of synthetic biology, architecture, and computation. Bottom of NAL staircase (staircase L) Where is the line between the natural and the artificial? Somewhere in the midst of Zero Park. Sascha Pohflepp’s installation leads you through a synthetic landscape, which poses questions about human agency in natural ecosystems. Bacteria are no longer the bane, but the birth of tapestries! Natsai Audrey Chieza creates a gallery of futurist scarves for which bacteria are the sole agent of colour transformation. In collaboration with John Ward, professor of Structural Molecular Biology, University College London. Breathing, living, ‘second skins’ change their shape and appearance as you approach. Silicon-like smart-fabrics show movement and moving patterns. 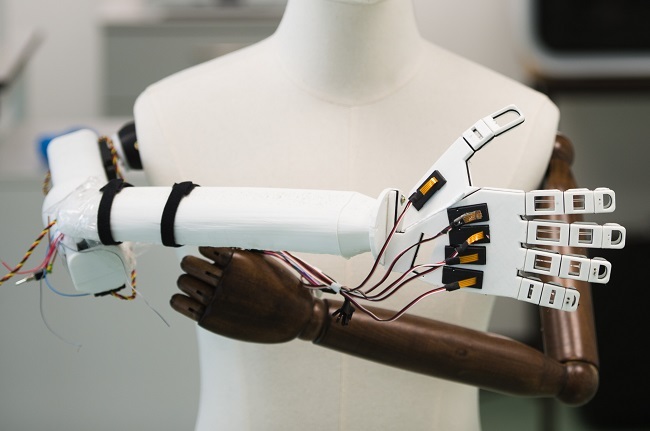 The Cyborg project – led by Carlos Olguin, with Autodesk Research – explores possibilities of new software to create materials with their own ‘life’. ‘Lucy’, the extinct hominid Autralopithecus Afarensis, performs an opera just for you. Marguerite Humeau recreates her vocal tract and cords to bring you the lost voice of this prehistoric creature. Can we imagine what it sounds like inside the molecular structure of a DNA helix? This composition is inspired by theoretical speculation on bacteria’s ability to transmit EMF signals, played amongst the V&A’s cast collection. Will Carey explores how living things will replace the products and foods we use today: from packaging that produces its own drink to skincare products secreted from bespoke microbial cultures. This series of images show exotic commodities that could be normal to future generations. Join this workshop to create your own synthetic corals and contribute to the V&A’s very own coral reef. Michail Vanis invites you to bring seemingly impossible scenarios to life and discuss their scientific and ethical implications. DNA replication, Bjork, swallowable perfume… these eight films demonstrate a myriad of cultural crossovers; synthetic biology at its aesthetic finest. The authors of Synthetic Aesthetics pry open the circuitry of a new biology, exposing the motherboard of nature. A presentation by designer Alexandra Daisy Ginsberg will be followed by a panel discussion with members of the team behind Synthetic Aesthetics Drew Endy, Jane Calvert, Pablo Schyfter and Alistair Elfick. Chaired by The Economist’s Oliver Morton. What happens when science leaves the lab? Recent advances in synthetic biology mean scientists will be the architects of life, creating blueprints for living systems and organisms. Blueprints for the Unknown investigates what might happen as engineering biology meets the complex world we live in. Speakers include Koby Barhad, David Benqué, Raphael Kim and Superflux. Blueprints for the Unknown is a project by Design Interactions Research at the Royal College of Art as part of the Studiolab research project. Extract your own DNA in the V&A’s popup Wetlab and chat with synthetic biologists from Imperial College London. Synthetic biology designs life at the scale of DNA, and tonight you can take the raw materials of life home with you. With thanks to Imperial College London’s EPSRC National Centre for Synthetic Biology & Innovation and SynbiCITE UK Innovation and Knowledge Centre for Synthetic Biology. Your computer’s hard drive is nothing compared to nature’s awesome capacity to record information. Artist Charlotte Jarvis explores how DNA can be used to record things apart from genetics – such as music – in the centuries to come. With scientist Nick Goldman and composer Mira Calix, Music of the Spheres encodes music into the structure of DNA suspended in soap solution. An immersive, surprising performance introduced by Jarvis, Calix and Goldman as they release musical bubbles in the garden. This is a work in progress. Synbio tarot card readings reveal possible outcomes, both desirable and disastrous, to which science might lead us. Exploring the social, economic and political implications of synthetic biology in the cards, from dream world to dystopia. The new book Synthetic Aesthetics: Investigating Synthetic Biology’s Designs on Nature marks a development in the emerging discipline of synthetic biology. For the book launch, designers, artists and scientists explain how their work bridges the gap between design and science. Drop in and hear Christina Agapakis, Sascha Pohflepp, David Benjamin and Will Carey over the course of the evening with social scientists Jane Calvert and Pablo Schyfter. (Please note coats and bags are not permitted in the Library. Please leave these items in the cloakroom on the ground floor). Souvenir programme wrap designed by London-based graphic design consultancy Kellenberger–White. Having observed how very deeply concerned scientists still are over the GMO (genetically modified organisms, sometimes also called ‘Frankenfoods’) panic that occurred in the early 2000s (I think), I suspect that efforts like this are meant (at least in part) to allay fears. In any event, the powers-that-be have taken a very engaging approach to their synthetic biology efforts. As for whether or not the event lived up to expectations, I have not been able to find any reviews or commentaries about it. This entry was posted in synthetic biology and tagged Alexandra Daisy Ginsberg, Alistair Elfick, biopixels, Björk, Carlos Olguin, Charlotte Jarvis, Christina Agapakis, Comme des Organismes, David Benjamin, David Benqué, Drew Berry, Drew Endy, Dunne & Raby, E. chromi, EPSRC, Future Foragers (2009) Tobias Revell, Hollow, Hy-Fi, James King, Jane Calvert, Jannis Huelsen, John Word, Kellenberger–White, Koby Barhad, Lucy McRae, Marguerite Humeau, Marie-Sarah Adenis, Michail Vanis, Mira Calix, Natsai Audrey Chieza, Neri Oxman, New Mumbai, Nick Goldman, NSF, Oliver Morton, Pablo Schyfter, Raphael Kim, Sascha Pohflepp, Silk Pavilion, Sissel Tolaas, Stefan Schwabe, Superflux, Swallowable Parfum, Synthetic Aesthetics: Investigating Synthetic Biology's Designs on Nature, Thomas Landrain, UCSD, UK, UK Engineering and Physical Sciences Research Council, US National Science Foundation, Victoria and Albert musem, Will Carey, Zeitguised on May 5, 2014 by Maryse de la Giroday. The Technology Strategy Board and the Engineering and Physical Sciences Research Council (EPSRC) are investing up to £2.5m in feasibility studies to accelerate commercial applications in the novel material, graphene. It will include related carbon-based, two-dimensional nanotechnologies that have recently emerged from the science base. This competition will invest in projects that explore the realistic potential of graphene to yield new products that could disrupt markets. We expect them to stimulate development of a robust and competitive supply base to support the nascent graphene-using industry. Proposals must be collaborative and business-led. We are looking to attract consortia drawn from small and medium- sized enterprises (SMEs) and/or large companies. Universities and other research organisations can be partners in consortia where their high-end academic knowledge and innovation expertise is needed to deliver the project. We expect to fund feasibility studies (mainly pre-industrial research projects) in which a business partner will generally attract up to 65% public funding for their project costs (75% for SMEs). Research organisations can attract funding of up to 100% of their costs. We expect projects to last up to 12 months and to range in size up to total costs of £200k. This competition opens on 7 April 2014 and the deadline for receipt of applications is noon on 4 June 2014. A briefing for potential applicants will be held on 24 April 2014. Consortium building events will be run by the Graphene Special Interest Group between 27 February 2014 and 18 March 2014. We strongly advise potential applicants to attend at least one of these events. There is a deadline for registration (May 28, 2014 noon UK time) and you must register before submitting your proposal. The Technology Strategy Board offers a competition brief (PDF) and more details on its Realising the graphene revolution webpage. This entry was posted in graphene, nanotechnology and tagged commercialising graphene feasibility studies, commercializing graphene feasibility studies, Engineering and Physical Sciences Research Council, EPSRC, funding competition, Realising the graphene revolution, Technology Strategy Board, UK on February 12, 2014 by Maryse de la Giroday. Scientists have discovered a way to better exploit a process that could revolutionise the way that electronic products are made. The scientists from Imperial College London say improving the industrial process, which is called crystallisation, could revolutionise the way we produce electronic products, leading to advances across a whole range of fields; including reducing the cost and improving the design of plastic solar cells. The process of making many well-known products from plastics involves controlling the way that microscopic crystals are formed within the material. By controlling the way that these crystals are grown engineers can determine the properties they want such as transparency and toughness. Controlling the growth of these crystals involves engineers adding small amounts of chemical additives to plastic formulations. This approach is used in making food boxes and other transparent plastic containers, but up until now it has not been used in the electronics industry. The team from Imperial have now demonstrated that these additives can also be used to improve how an advanced type of flexible circuitry called plastic electronics is made. The team found that when the additives were included in the formulation of plastic electronic circuitry they could be printed more reliably and over larger areas, which would reduce fabrication costs in the industry. The team reported their findings this month in the journal Nature Materials (“Microstructure formation in molecular and polymer semiconductors assisted by nucleation agents”). Dr Stingelin and research associate Neil Treat looked at two additives, sold under the names IrgaclearÒ XT 386 and MilladÒ 3988, which are commonly used in industry. These chemicals are, for example, some of the ingredients used to improve the transparency of plastic drinking bottles. The researchers experimented with adding tiny amounts of these chemicals to the formulas of several different electrically conducting plastics, which are used in technologies such as security key cards, solar cells and displays. The researchers found the additives gave them precise control over where crystals would form, meaning they could also control which parts of the printed material would conduct electricity. In addition, the crystallisations happened faster than normal. Usually plastic electronics are exposed to high temperatures to speed up the crystallisation process, but this can degrade the materials. This heat treatment treatment is no longer necessary if the additives are used. Another industrially important advantage of using small amounts of the additives was that the crystallisation process happened more uniformly throughout the plastics, giving a consistent distribution of crystals. The team say this could enable circuits in plastic electronics to be produced quickly and easily with roll-to-roll printing procedures similar to those used in the newspaper industry. This has been very challenging to achieve previously. Dr Stingelin and Dr Treat collaborated with scientists from the University of California Santa Barbara (UCSB), and the National Renewable Energy Laboratory in Golden, US, and the Swiss Federal Institute of Technology on this study. The team are planning to continue working together to see if subtle chemical changes to the additives improve their effects – and design new additives. They [the multinational team from ICL, UCSB, National Renewable Energy Laboratory, and Swiss Federal Institute of Technology] will be working with the new Engineering and Physical Sciences Research Council (EPSRC)-funded Centre for Innovative Manufacturing in Large Area Electronics in order to drive the industrial exploitation of their process. The £5.6 million of funding for this centre, to be led by researchers from Cambridge University, was announced earlier this year . They are also exploring collaborations with printing companies with a view to further developing their circuit printing technique. This article is open access (at least for now). This entry was posted in electronics, nanotechnology and tagged bottom-up engineering, Cambridge University, Christopher G. Shuttle, Craig J. Hawker, crystals, Engineering and Physical Sciences Research Council, EPSRC, Garry Rumbles, ICL, Imperial College London, Jennifer A. Nekuda Malik, Joshua Howgego, Liyang Yu, Michael L. Chabinyc, Microstructure formation in molecular and polymer semiconductors assisted by nucleation agents, Natalie Stingelin, National Renewable Energy Laboratory, Neil D. Treat, Obadiah Reid, Paul Smith, plastics, Swiss Federal Institute of Technology, Switzerland, UCSB, UK, University of California Santa Barbara, US on July 9, 2013 by Maryse de la Giroday. As noted on numerous occasions here (most recently in an Oct. 11, 2012 posting), there is a competition for two prizes of 1 billion Euros each to be awarded to two European research projects in the European Union’s Future and Emerging Technologies Initiatives (FET). There are six flagship projects (whittled down from a larger number a few years ago) competing to be one of the two winners. There’s more about the FET Graphene Flagship project here. As you might expect, the Brits are heavily involved in the graphene flagship project. This entry was posted in business, nanotechnology and tagged Eduardo Saiz, Engineering and Physical Sciences Research Council, EPSRC, European Union, FET, FET Graphene Flagship project, Future and Emerging Technologies, George Osborne, graphene, GRAPHENE-CA flagship project, Imperial College of London, Norbert Klein, Tony Kinloch, UK on December 28, 2012 by Maryse de la Giroday. Scientists at the University of Liverpool are leading a £1.65 million project to produce and test the first nanomedicines for treating HIV/AIDS. The research project, funded by the [UK] Engineering and Physical Sciences Research Council (EPSRC), aims to produce cheaper, more effective medicines which have fewer side effects and are easier to give to newborns and children. The new therapy options were generated by modifying existing HIV treatments, called antiretrovirals (ARVs). The University has recently produced ARV drug particles at the nanoscale which potentially reduce the toxicity and variability in the response different patients have to therapies. Drug nanoparticles have been shown to allow smaller doses in other disease areas which opens up possibilities to reduce drug side-effects and the risk of drug resistance. Nanoscale objects are less than one micron in size – a human hair is approximately 80 microns in diameter. This entry was posted in medicine, nanotechnology and tagged AIDS, Andrew Owen, antiretrovirals, ARVs, EPSRC, HIV, Julio Montaner, Médecins Sans Frontières, Steve Rannard, UK Engineering and Physical Sciences Research Council, University of Liverpool on August 30, 2012 by Maryse de la Giroday.